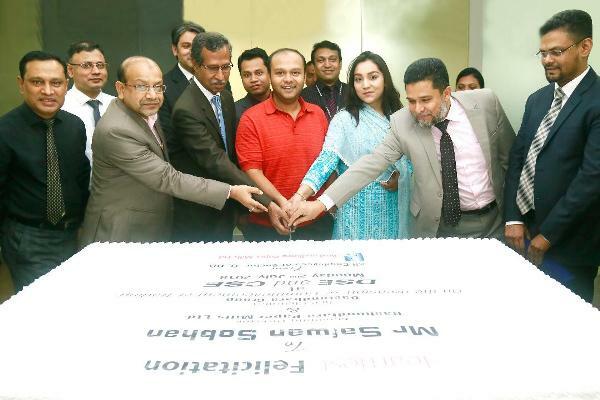 Bashundhara Group vice-chairman Safwan Sobhan Tasvir, director Yeasha Sobhan and other officials cut a cake at the group headquarters in the capital to celebrate the debut of share trading of Bashundhara Paper Mills Ltd on the country’s two bourses on Monday. Bashundhara Paper Mills Ltd, a concern of country’s leading business conglomerate Bashundhara Group, made a flying trade debut in the country’s two bourses on Monday by becoming the turnover leader. Each share of the company was traded between Tk 129.40 and Tk 155 on Dhaka Stock Exchange (DSE) before closing at Tk 130.80, registering a 63 per cent increase over its issue price of Tk 80. The company dominated the turnover chart on the premier bourse with 6.31 million shares worth Tk 886.58 million changing hands. On the Chittagong Stock Exchange (CSE), each share of the company was traded between Tk 126.10 and Tk 150 before closing at Tk 127.20. A total of 1.51 million shares changed hands on the bourse, generating a turnover of Tk 205 million. Earlier in the morning, a trading commencement agreement was signed between the Dhaka Stock Exchange (DSE) and Bashundhara Paper Mills Ltd (BPML). DSE head of listing department Abdul Jalil and Bashundhara Group deputy managing director Md Mustafizur Rahman signed the agreement on behalf of their respective organisations at DSE office in the city. DSE acting managing director Abdul Matin Patwary, chief regulatory officer AKM Ziaul Hasan Khan, BPML chief financial officer Mirja Mujahidul Islam, company secretary M Nasimul Hye, general manager Azizur Rahman and issue manager AAA Finance and Investment chairman Khwaja Arif Ahmed were also present at the agreement signing. Bashundhara Paper Mills signed a similar agreement with CSE. Speaking on the occasion, Md Mustafizur Rahman said investors have confidence in Bashundhara Paper Mills and the company will try to further the confidence. Company secretary M Nasimul Hye said Meghna Cement, a concern of Bashundhara Group, got enlisted with capital market in 1995 and investors showed their highest confidence in its shares. “Like that, investors will keep their confidence in Bashundhara Paper Mills. Bashundhara Paper Mills has three units and will be expanded further in future,” he said. Bashundhara Paper Mills raised a capital worth Tk 2.0 billion by floating more than 26 million ordinary shares. Of the total issued shares, eligible investors got 15.6 million shares at the cut-off price of Tk 80 each under the book-building method. The remaining 10.4 million shares were issued to the general public, including non-resident Bangladeshis, at 10 percent discount on the cut-off price of Tk 72 each. The lottery for allotting ordinary shares under the initial public offering (IPO) of BPML was held at ICCB on May 30. DSE later approved the listing of BPML to facilitate the trading of its shares, and the IPO shares of the company were credited into the respective BO accounts on June 24. Bashundhara Paper Mills authorities celebrated the debut of the company’s shares at a function at Bashundhara Group headquarters in the capital on Monday.